Humans in Geelong Expo 2018 - FREE community event highlighting our amazing locals. Live performances, guest speakers, exhibitions and more. Meet Nasir Sobhani ‘The Street’s Barber’! White Night (Nuit Blanche) began in Paris in 2002. Since then White Night events have been held in more than 20 cities around the world, tailored to each city's distinct passions and characteristics. This will be the first White Night Geelong. It will light up the city and transform its streets, laneways, parks and the foreshore with colourful projections and wondrous installations to music performances and interactive works. Essential information to help you plan your best experience, including Frequently Asked Questions can be found here. Did you know that the Geelong Show is the region’s largest 4 day show? It is packed full of competitions of all sorts, thrill seeker rides, tempting food, live entertainment, loads of stalls, displays and of course showbags! There is dog showing, horse jumping, wood chopping, poultry exhibitions, award winning cattle and sheep, monster trucks, fireworks, cooking demos, dancing and much more. Check out the program for what’s on when. The 2 Worlds Festival brings cultures together in a fun, entertaining and interactive festival. It will showcase a variety of indigenous and western performers, art, Indigenous and modern multicultural food . The Geelong Cup is an important race in the lead up to Melbourne Cup and the rest of the Spring Racing Carnival. It attracts the nation's leading trainers and jockeys, as well as international horses. There is fun for everyone with plenty of activities available, including the popular Fashions on the Field for ladies and gentlemen. In 2018 the total prize pool is worth over $24,000. 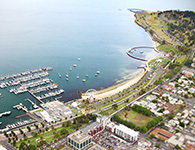 The bet365 Geelong Cup Day is a public Holiday recognised by the City of Geelong. North Geelong Secondary College is holding its annual Multicultural Festival, a celebration of cultural diversity and major fundraiser for the college. There will be food trucks, market stalls, amusement rides and live entertainment. Oktoberfest is fastly becoming one of the most anticipated days in the event calendar in October. Do you love dressing-up and having some fun with your mates? Then check out this event. There is live music, a silent disco, food trucks to cater for all tastebuds, tradtional German-style beer and food, competitions and more.